Selling cancer awareness bracelets has proven to be successful as a fundraiser for cancer causes. We have two cancer awareness products that have been particularly useful in cancer fundraisers. For information on cancer awareness fundraising, or help in planning a cancer awareness event, please visit our pages Cancer Awareness, What is it? and Planning The Perfect Cancer Awareness Event or Fundraiser. 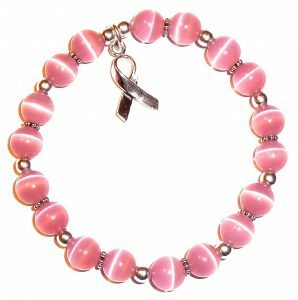 Our beautiful, handcrafted bracelets are a high quality cancer awareness product that can be used for re-sale in fundraising. They cost as little as 3.75 for stretch cord cancer awareness bracelets and 3.50 for wire cancer awareness bracelets. Each cancer awareness bracelet can be re-sold for 5.00 to 10.00. We offer a 15% discount for cancer awareness bracelets that are used to raise money that will be donated to cancer causes. If you are conducting a fundraiser and plan to donate money to a cause, please email us at CustomerService@hiddenhollowbeads.com. Tell us about yourself, outlining the way you intend to use our cancer awareness products and where you plan to donate the proceeds, and we will send you a discount code. 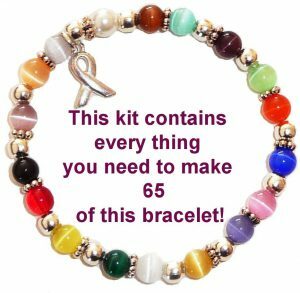 Cancer Awareness Bracelet Kit – Comes with everything you need to make 65 bracelets. We offer a 15% discount for cancer awareness kits that will be used for donating proceeds to a cancer awareness cause. Our cancer awareness kits come with everything you need to make bracelets yourself, giving you a much larger profit margin for re-sale. Cancer awareness bracelets can be made for as little as 1.36 each, and resold for a greater profit margin. Making the bracelets is not complicated and can be fun as a group activity. If you are conducting a fundraiser and plan to donate money to a cause, please email us at CustomerService@hiddenhollowbeads.com. Tell us about yourself, outlining the way you intend to use our cancer awareness products and where you plan to donate the proceeds, and we will send you a discount code. Finished bracelets sell for $5-10 dollars each. We offer a 15% discount on all of our cancer awareness products and kits, in addition to those outlined above. If you are conducting a fundraiser and plan to donate money to a cause, please email us at CustomerService@hiddenhollowbeads.com. Tell us about yourself, outlining the way you intend to use our cancer awareness products and where you plan to donate the proceeds, and we will send you a discount code. Custom bracelets are also available. If you are holding a fundraiser for a school, or if you want specific colors for any reason, we are happy to help you with your custom order. Click here for Custom Bracelets. We support cancer awareness and want to do our part. A portion of our profits go to support cancer research. In addition, we want to offer a discount for cancer awareness items that are used to raise money for cancer causes. We realize that it can be difficult to provide documentation for your cause, and want to make it as easy as possible for you to qualify for our discount for cancer awareness products. We already maintain the lowest possible price on all of our high-quality cancer awareness items, even without a discount. So we ask that you be honorable. Please only ask for the discount if you honestly plan to donate your profits to a cancer cause. If you are conducting a fundraiser and plan to donate money to a cause, please email us at CustomerService@hiddenhollowbeads.com. Tell us about yourself, outlining the way you intend to use our cancer awareness products and where you plan to donate the proceeds, and we will send you a discount code. You MUST email us BEFORE placing your order! The only exception is Sterling Silver. We can not discount 15% on any sterling silver item, as our markup is very low. We are sorry. We know that many of you use the Sterling Silver for your cancer awareness bracelets, but we can still refund 15% on the remainder of your order. So still drop us an email, even if part of your order is Sterling Silver. Thank you for helping to fight cancer through fundraising efforts! We appreciate each of you and the work that you do. Keep up the good work! Together, we can win the war! Please click this link to share your story on our Facebook page. We would love to hear how you support cancer awareness, and how you have used our beads or bracelets to help in some way.